Gunmen wearing military uniforms stormed Tunisia’s national museum Wednesday (18 March), killing 17 foreign tourists and two Tunisians in one of the worst militant attacks in a country that had largely escaped the region’s Arab Spring turmoil. The EU first condemned the attack, first attributing it to ISIS, and then blaming “terrorist organisations”. Five Japanese as well as visitors from Italy, Poland and Spain were among the dead in the assault on Bardo museum, inside the heavily guarded parliament compound in Tunis, Prime Minister Habib Essid said. Scores of visitors fled into the museum and the militants – who authorities did not immediately link to any extremist group – took hostages inside, officials said. Security forces entered around two hours later, killed two militants and freed the captives, a government spokesman said. A police officer died in the operation. The attack on such a high-profile target is a blow for the small North African country that relies heavily on European tourism and has mostly avoided major militant violence since its 2011 uprising to oust autocrat Zine El-Abidine Ben Ali. 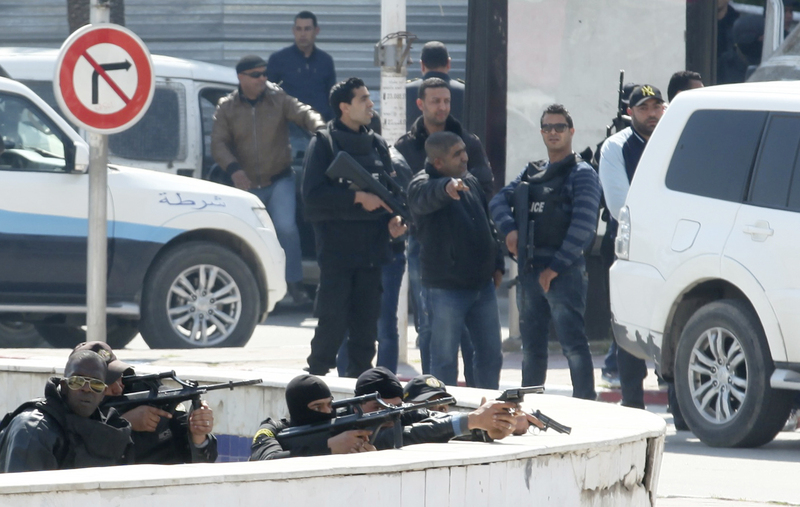 Several Islamist militant groups have emerged in Tunisia since the uprising, and authorities estimate about 3,000 Tunisians have also joined fighters in Iraq and Syria — igniting fears they could return and mount attacks at home. “All Tunisians should be united after this attack which was aimed at destroying the Tunisian economy,” Prime Minister Essid declared in a national address. The local stock exchange dropped nearly 2.5% and two German tour operators said they were cancelling trips from Tunisia’s beach resorts to Tunis for a few days. Accor, Europe’s largest hotel group, said it had tightened security at its two hotels in Tunisia. Television footage showed dozens of people, including elderly foreigners and one man carrying a child, running for shelter in the museum compound, covered by security forces aiming rifles into the air. The Tunisian premier said 17 tourists were killed, including four Italians, a French citizen, a Pole, two Colombians, five Japanese, an Australian and two Spaniards. He had previous mentioned a German fatality, but did not mention that in later statements. Two Tunisians were killed. The museum is known for its collection of ancient Tunisian artifacts and mosaics and other treasures from classical Rome and Greece. There were no immediate reports that the attackers had copied Islamic State militants in Iraq by targeting exhibits seen by hardliners as idolatrous. Bardo’s white-walled halls set in the parliament compound are one of the most popular tourist attractions in the Tunisian capital. Many tourists come for day trips to Tunis from nearby Mediterranean beach resorts. Shocked but defiant, hundreds of Tunisians later gathered in the streets of downtown Tunis waving the country’s red and white crescent flag, and chanting against terrorism. European Union foreign policy chief Federica Mogherini blamed “terrorist organisations” for the attack. The EU corrected an earlier statement, removing a reference to Daesh, the Arabic acronym for Islamic State. “With the attack that has struck Tunis today, the terrorist organisations are once again targeting the countries and peoples of the Mediterranean region,” Mogherini said in a statement. “I am shocked by today's terrorist attack at the Bardo museum in Tunis. My thoughts are with the families of those whose loved ones have been killed, including several European Union nationals, and with the Tunisian people. French Prime Minister Manuel Valls said France was standing by the Tunisian government in the aftermath of an attack in which at least seven tourists were killed. "We are condemning this terrorist attack in the strongest terms," Valls said speaking after a meeting with European Commission President Jean-Claude Juncker in Brussels. "We are standing by the Tunisian government. We are very alert about how the situation is evolving," he added. Tunisia's uprising inspired the Arab Spring revolts in neighboring Libya and in Egypt, Syria and Yemen. But its adoption of a new constitution and staging of largely peaceful elections won widespread praise and stood in stark contrast to the chaos that has plagued those countries. After a crisis between secular leaders and the Islamist party which won the country's first post-revolt election, Tunisia has emerged as a model of compromise politics and transition to democracy for the region. But the attack comes at a challenging time with Tunisia planning to reform its economy and cutback on public spending. Tourism represents around 7% of the gross domestic product. Security forces have already clashed with some Islamist militants, including Ansar al-Sharia, which is listed as a terrorist group by Washington. But until now most attacks were in remote areas, often near the border with Algeria. Another group is holed up in the mountains along the Algerian border, where the army has spent months trying to destroy their camps. Affiliates of Islamic State militants fighting in Iraq and Syria have also been gaining ground in North Africa, especially in the chaotic environment of Tunisia's neighbor Libya, where two rival governments are battling for control.